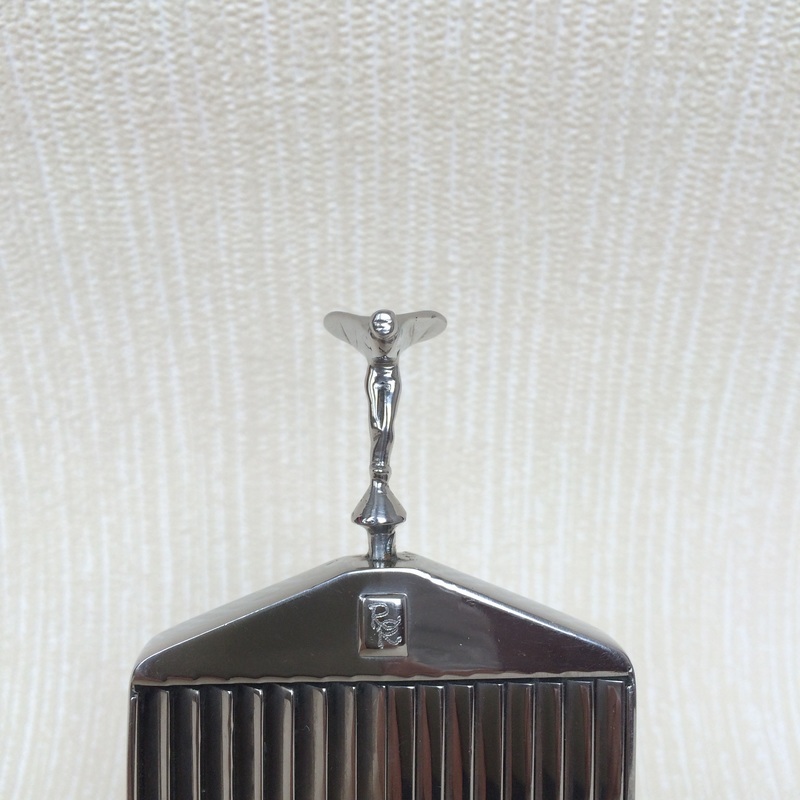 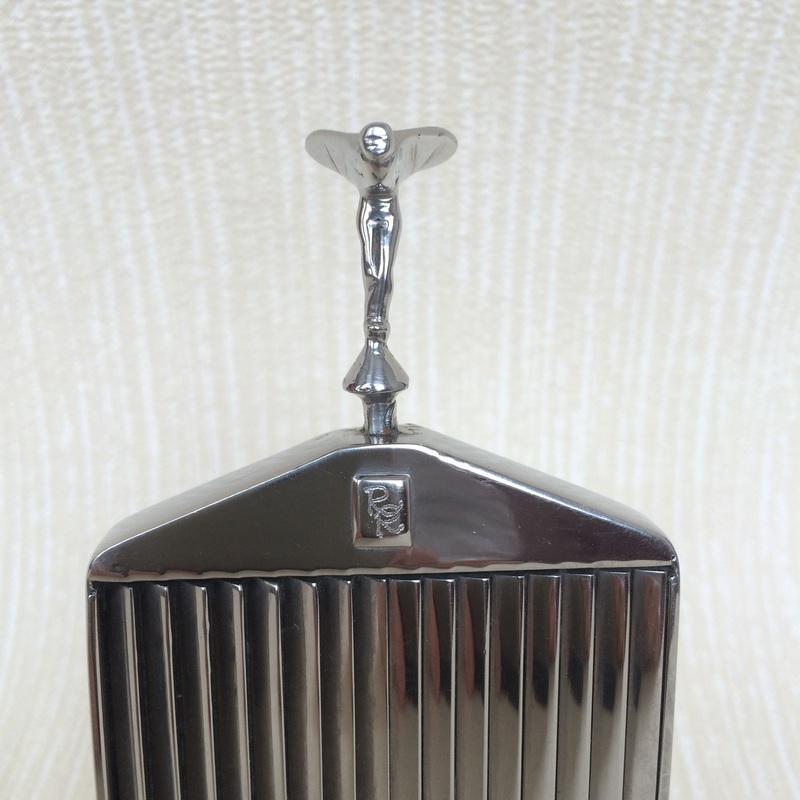 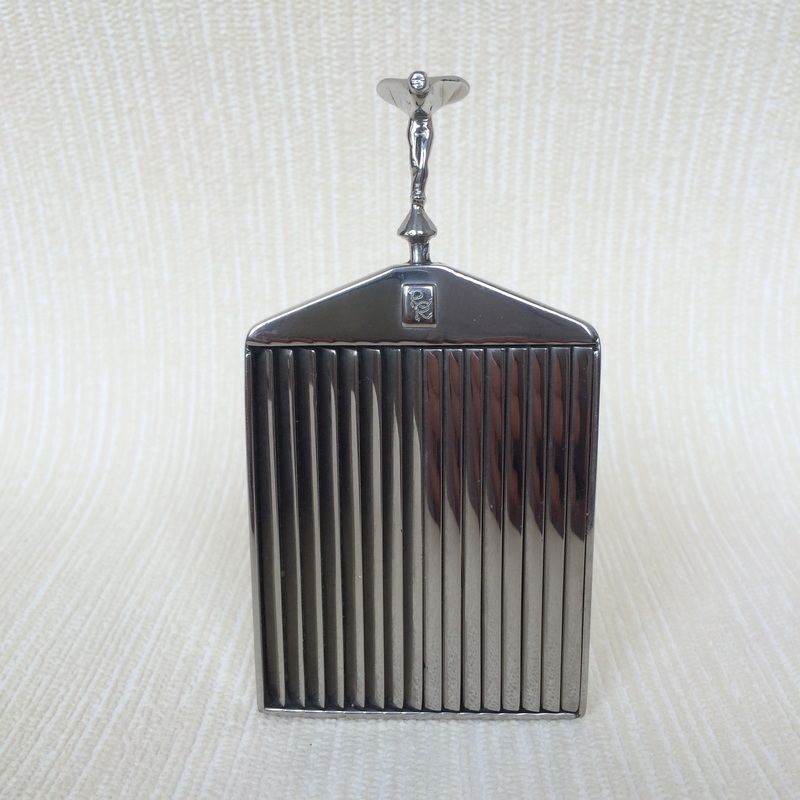 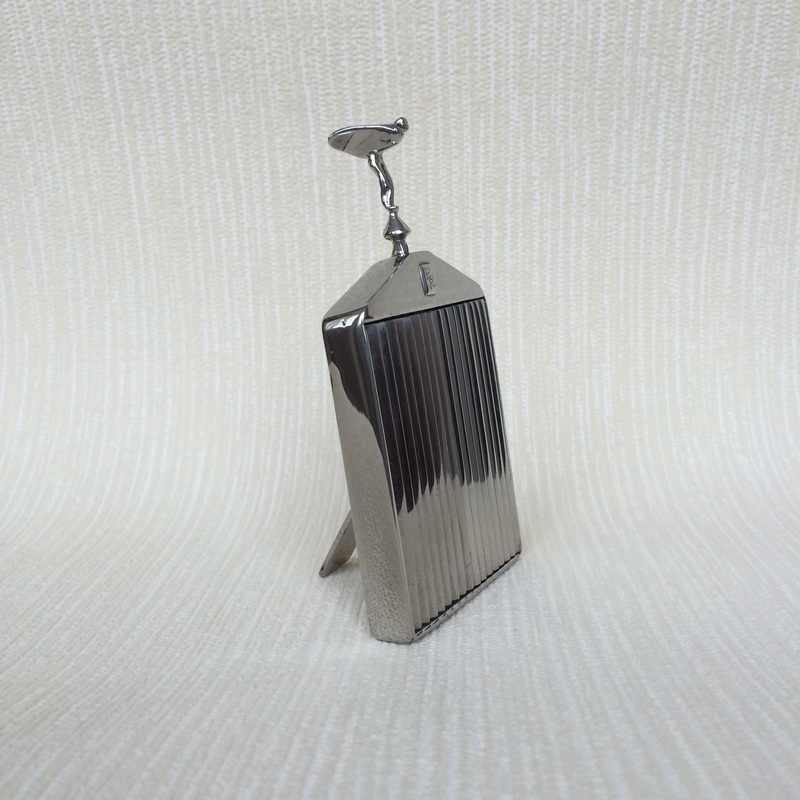 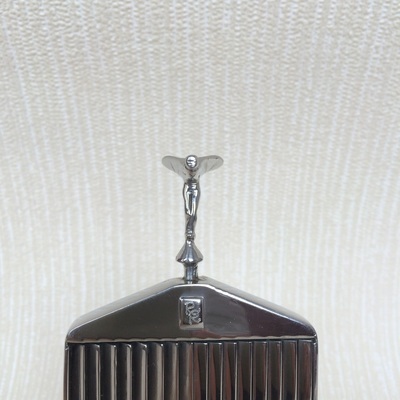 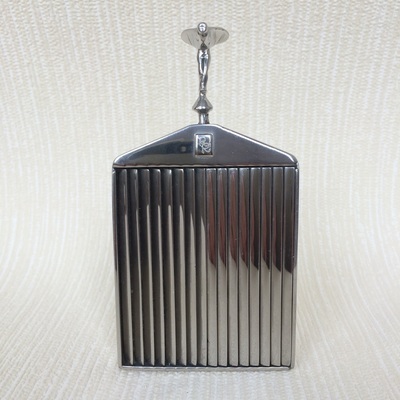 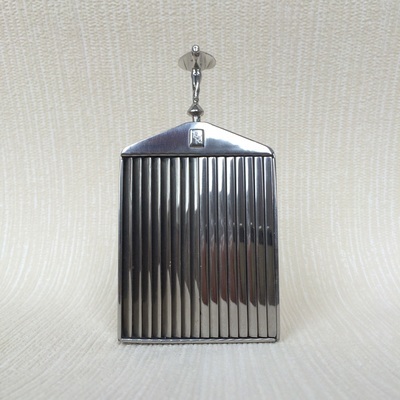 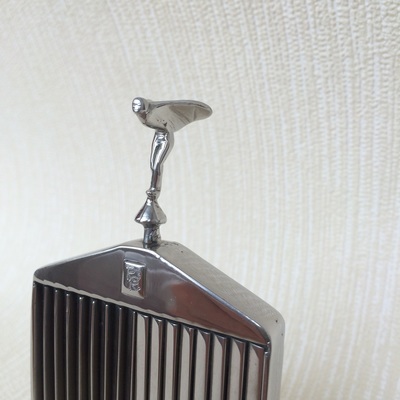 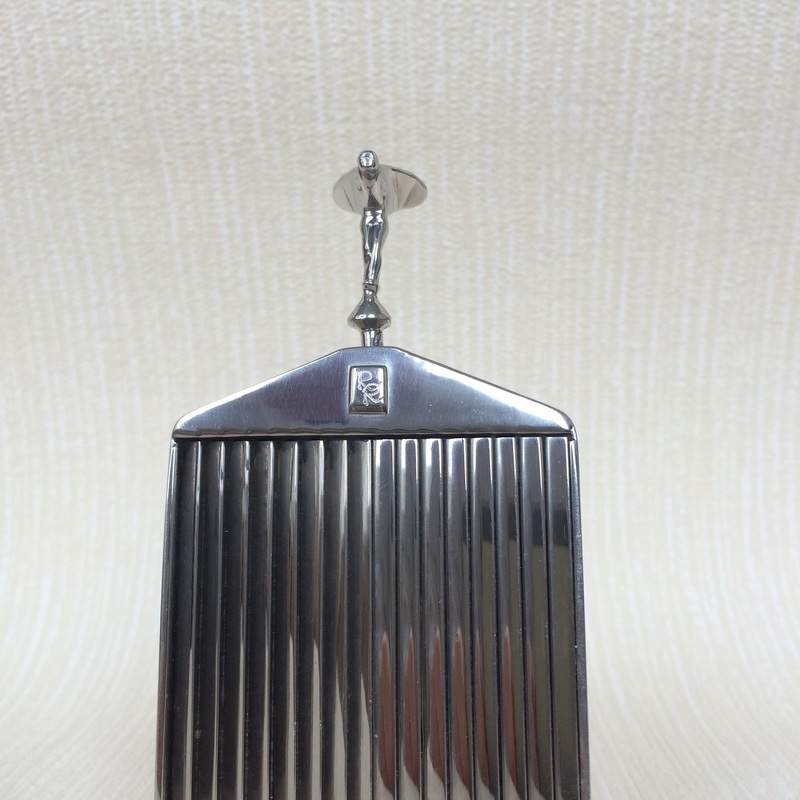 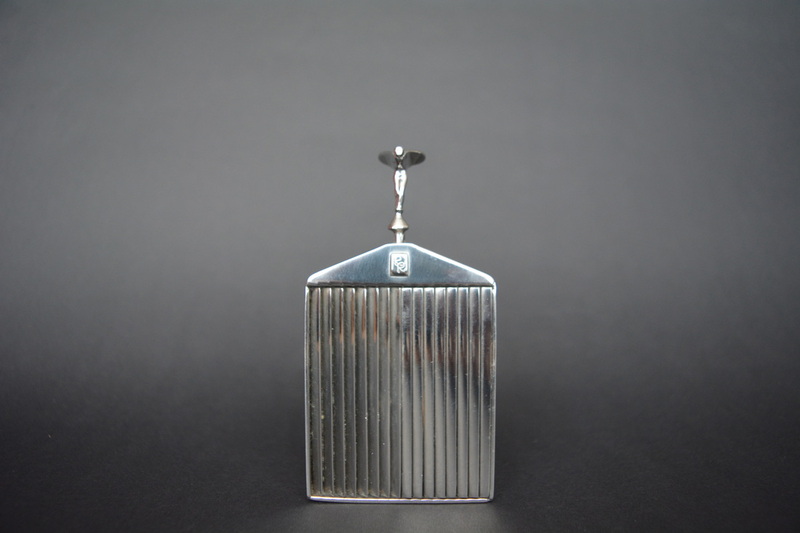 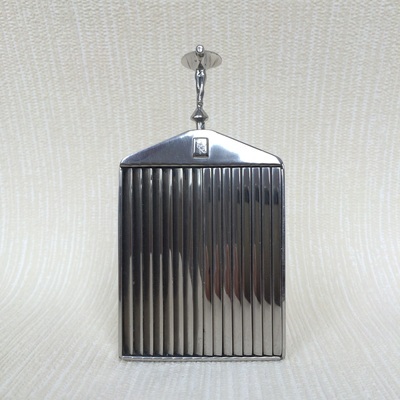 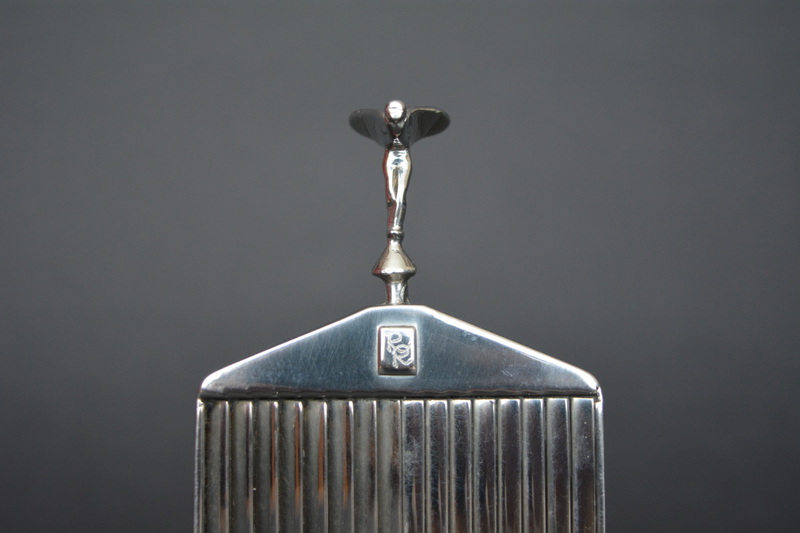 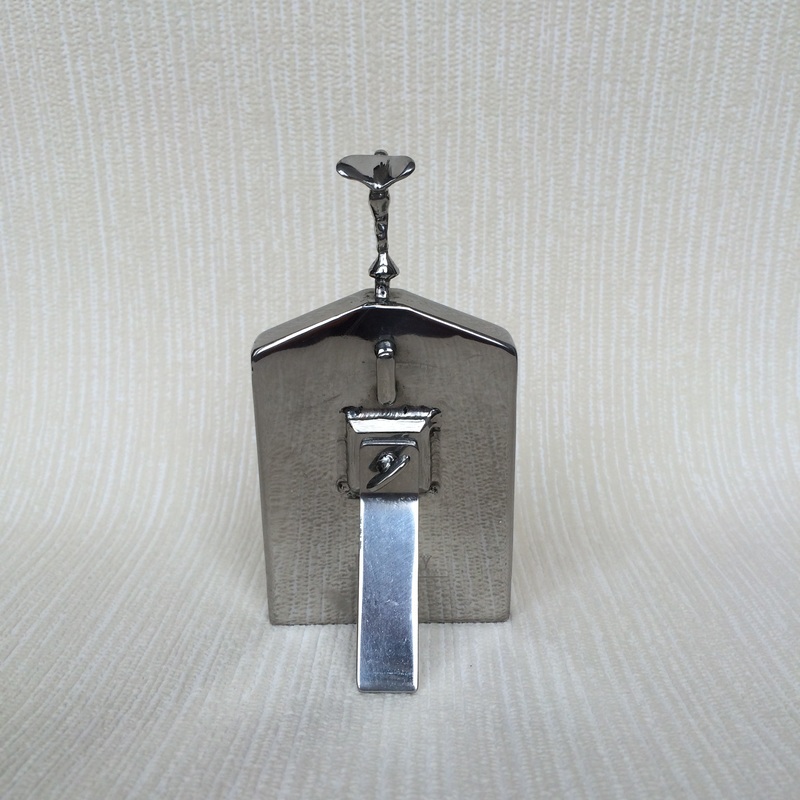 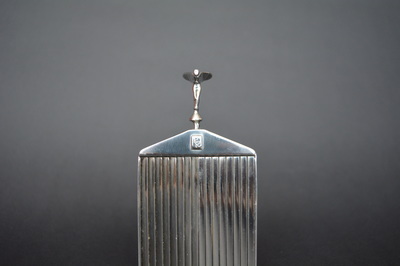 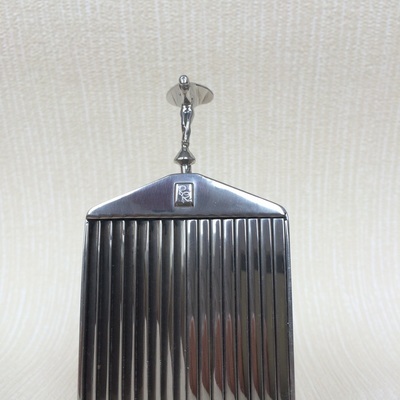 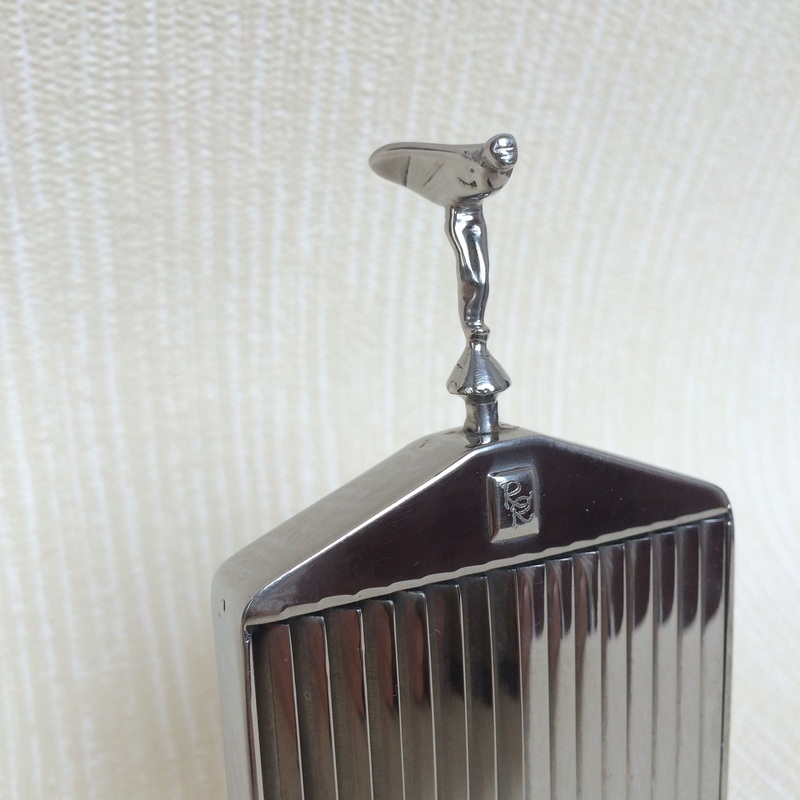 My Work, a model Rolls Royce Radiator as ornament or pendant. 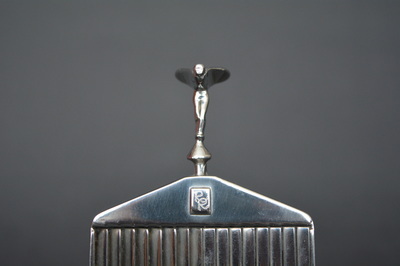 When I was a teenager I was fascinated with the Rolls Royce car as a prestige symbol. The vintage cars made visits to Blackpool as part of the annual Vintage Car Rally. 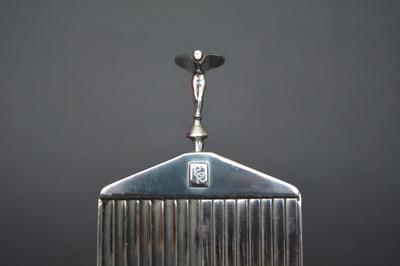 I remember taking photographs of the vehicles as they lined up in a row like a millionaire's car sales outlet. The centrepiece of the Rolls has always been the radiator and the famous mascot is so perfectly positioned at the top dead centre of the louvers which allow the air to enter beneath the bonnet of the engine. I served my apprenticeship as a skilled sheet metal worker. 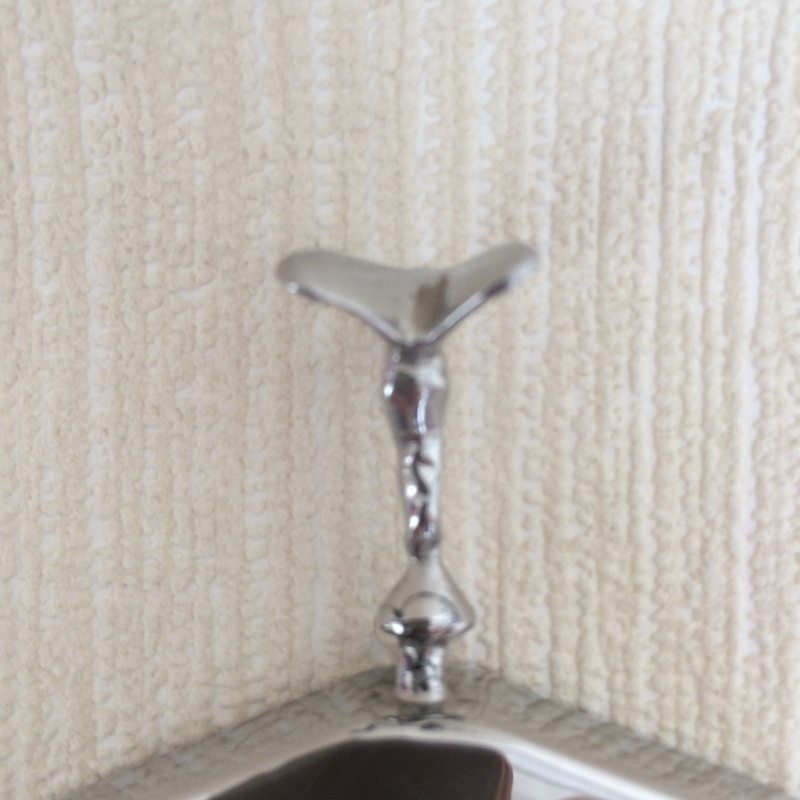 I have never been a mechanical minded tradesman. 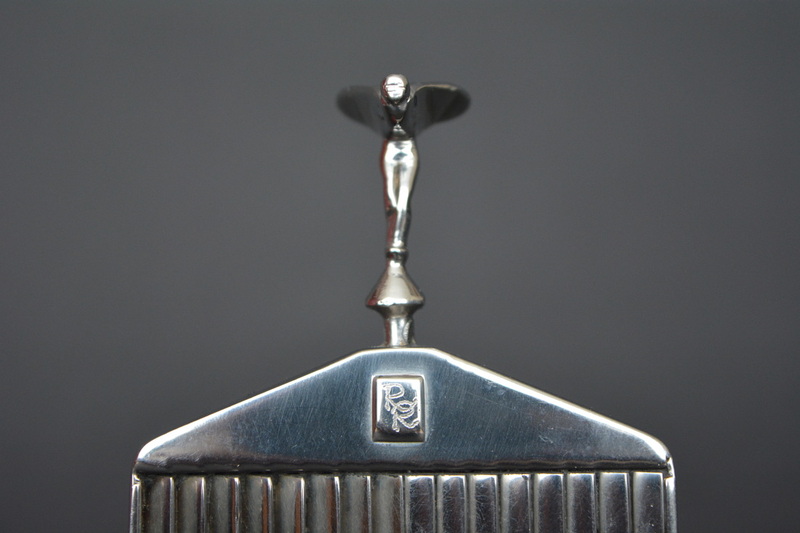 unlike my father and grandfather who spent their careers in the motor trade in Sheffield. When leaving school I was directed into the engineering industry by my careers teacher. 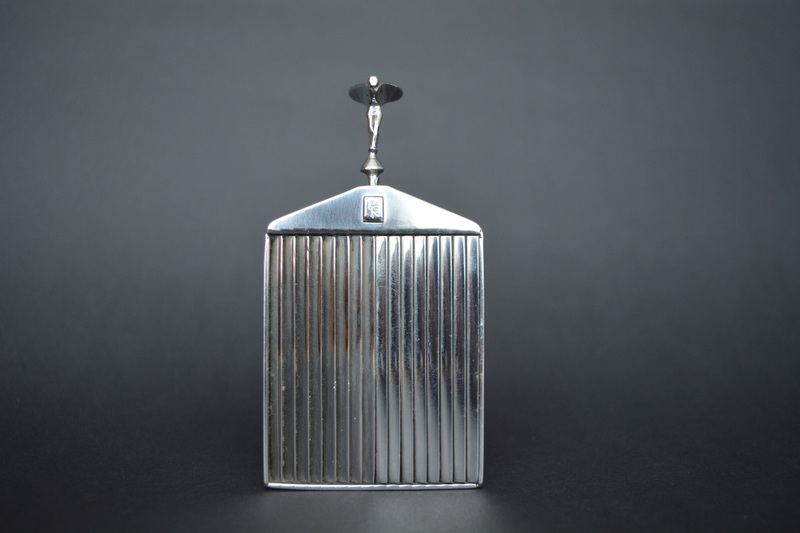 I found that to make something from a flat piece of sheet metal and turn it into a finished object was more rewarding than putting ready made parts together. 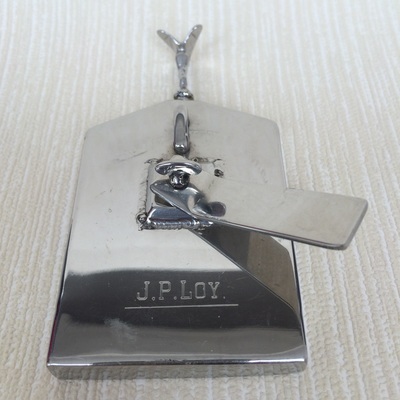 In the factory where I worked for three years during my apprenticeship it was a common expression to describe any item being made for home or private use as a 'foreigner'. 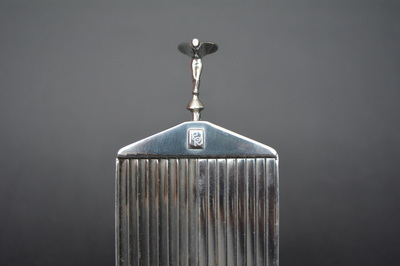 I decided to make my model Rolls Royce radiator as a 'foreigner' and kind of statement of rebellion in protest for working on a minimum wage. 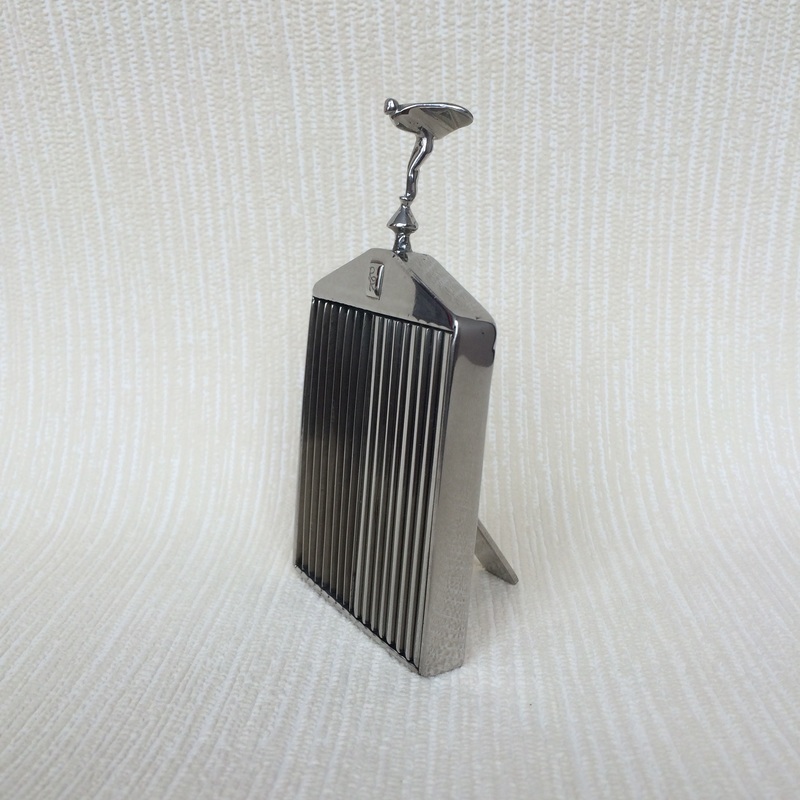 Here is my own model of the Rolls Royce radiator. 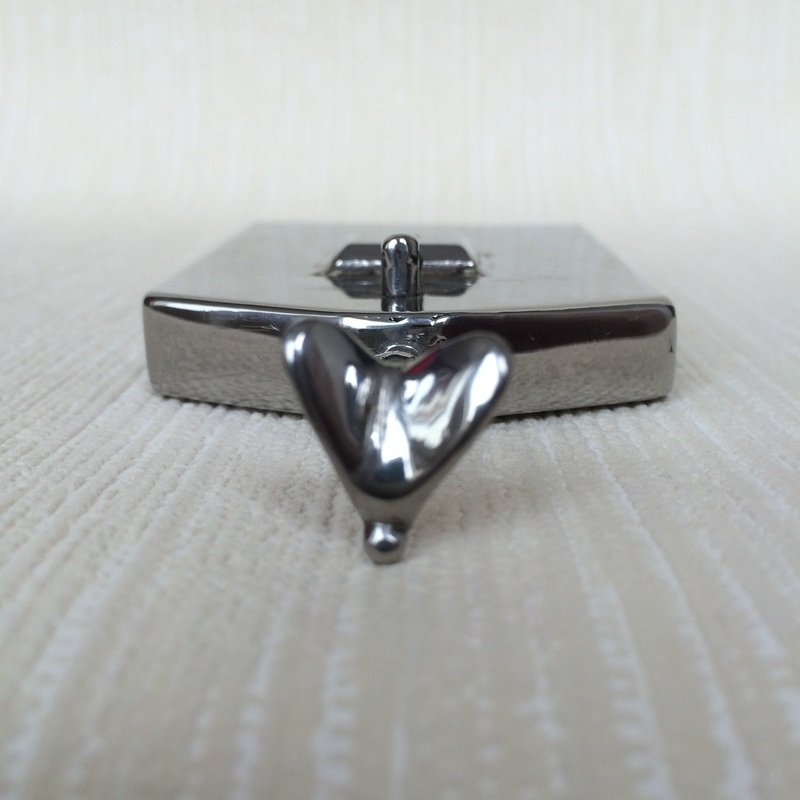 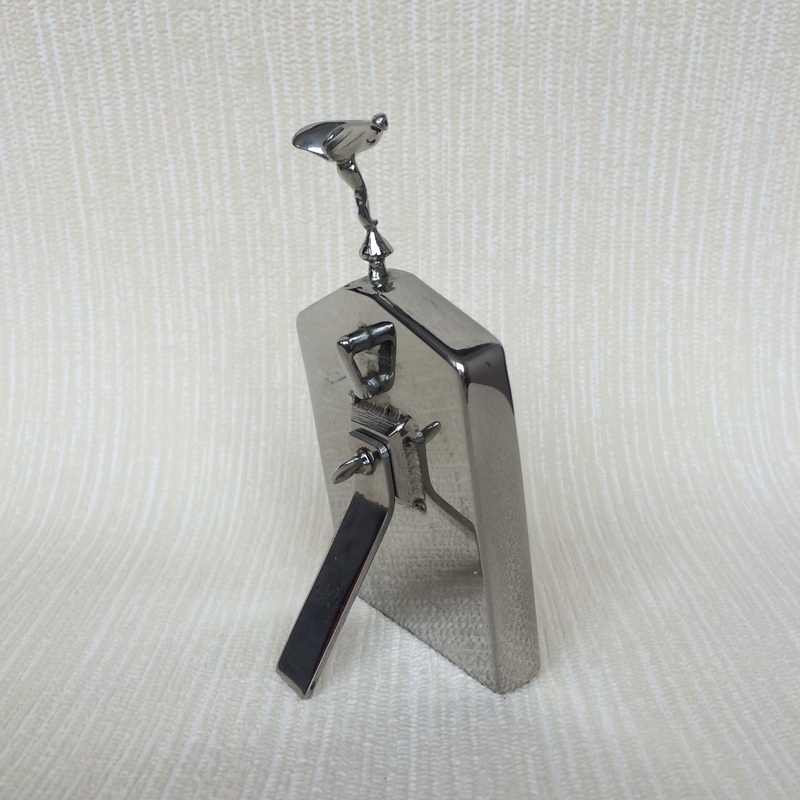 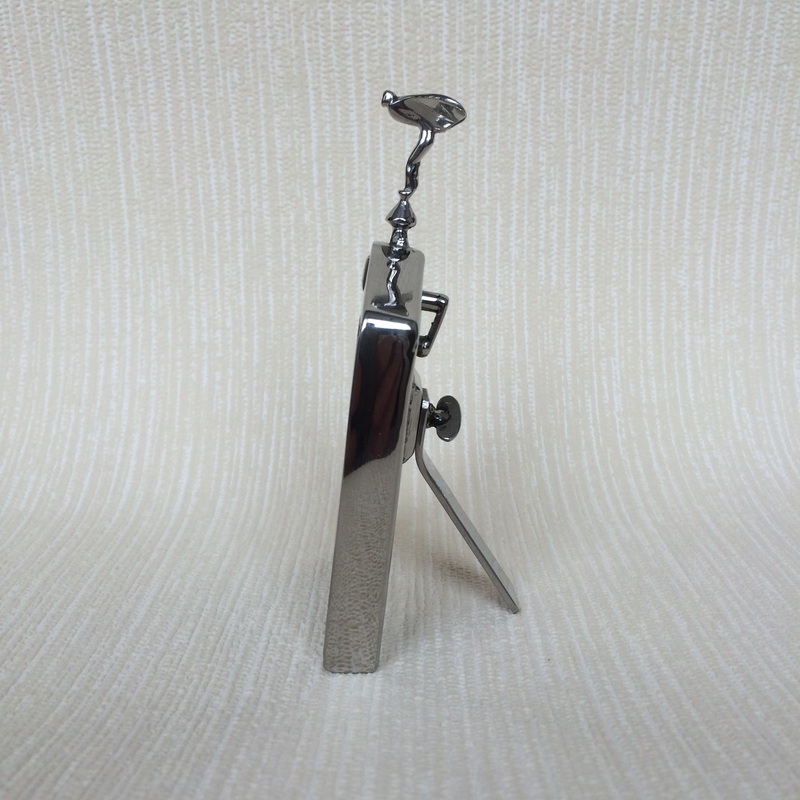 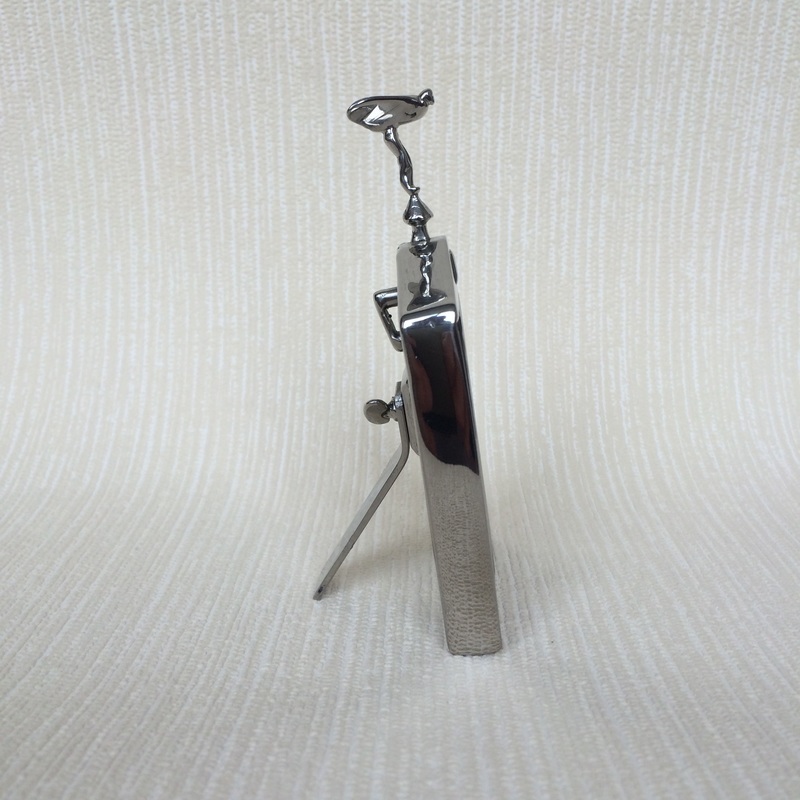 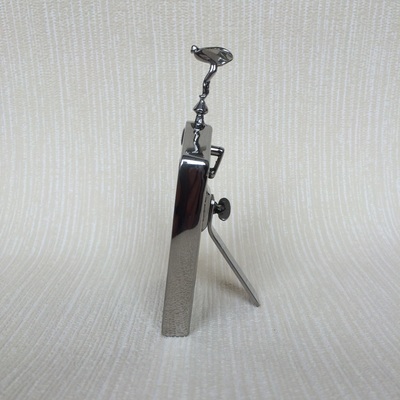 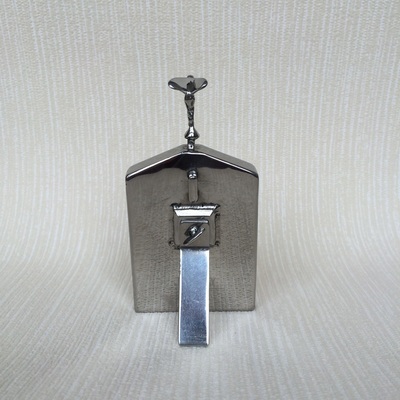 It is made of welded and polished pieces of stainless steel. They are joined together to give the appearance of a mini RR radiator. 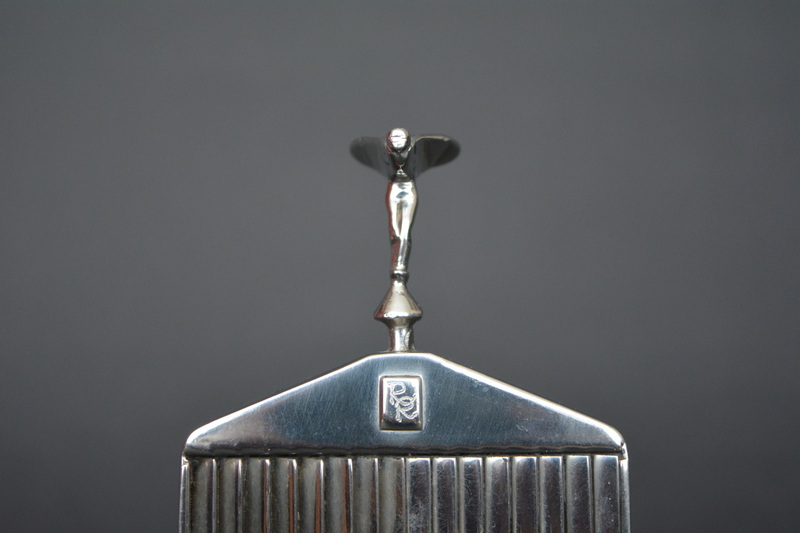 I realise the Spirit of Ecstasy is not made to any original scale that relates to the rest of the radiator but that gives my model a different look on the whole form. 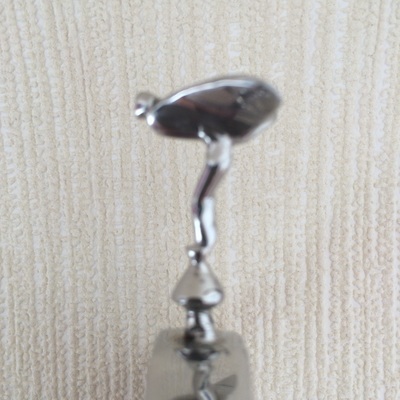 She was made from bending stainless steel rod and filing to form the shape of the main body. 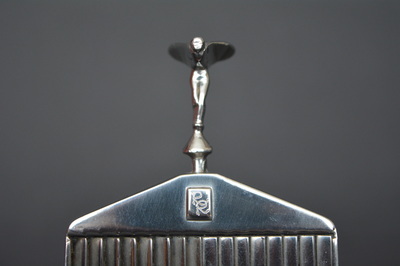 The wings were welded onto the torso. 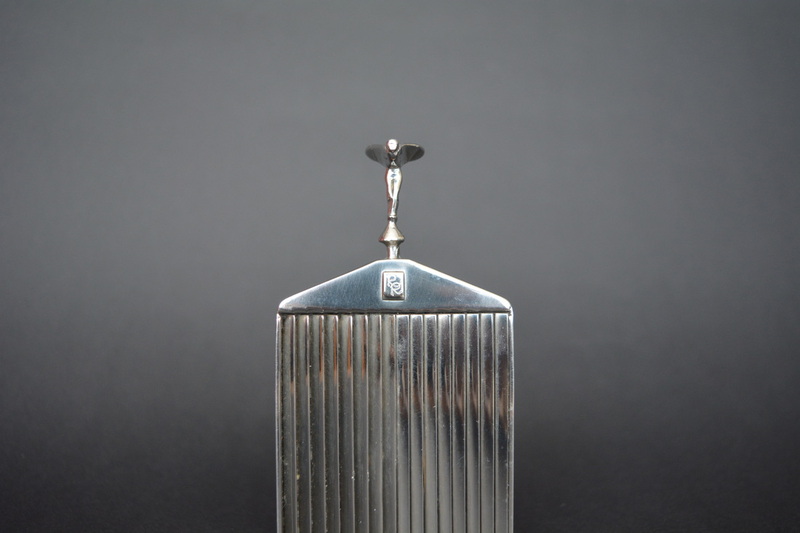 I later found out that I had not positioned the louvers correctly but by the time this had been pointed out to me it was too late, they had all been welded together. 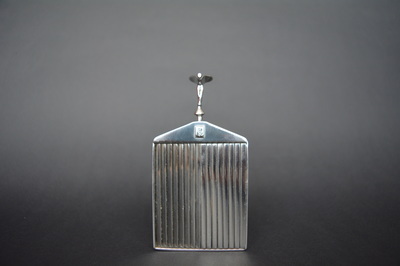 I was just seventeen years old when I made this piece. It stands on a flat surface with a support bracket which is screwed onto the back plate. 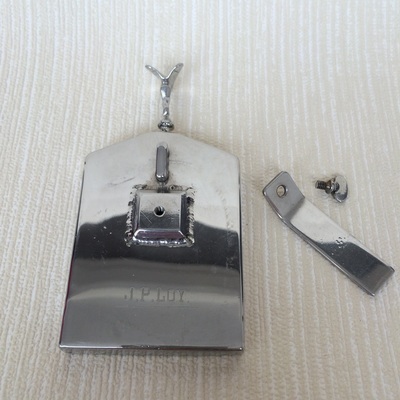 There is also a welded eyelet on the back plate to allow a leather thong to be threaded and used as a heavy duty pendant. The backplate is engraved with my name. 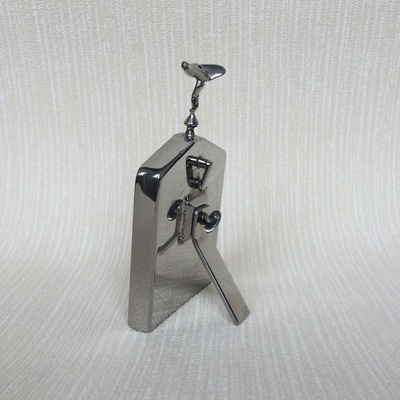 The dimensions are 106 high x 56 wide x 16 mm deep (without stand) and 40 mm deep with stand. The main body is 10 mm deep. Total weight = 335 grammes. 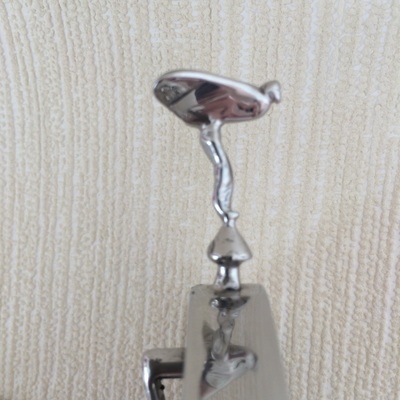 It has welded together about twenty four pieces of stainless steel to make up the body and about three pieces of stainless steel to make the mascot. 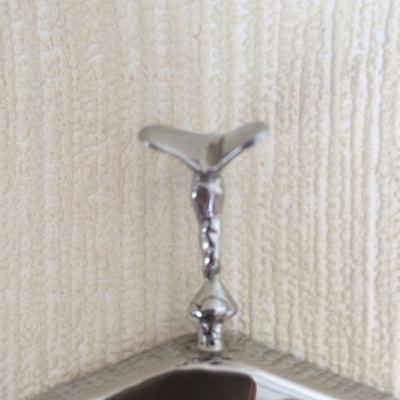 ​The whole project took about six months to complete between 1970-71. 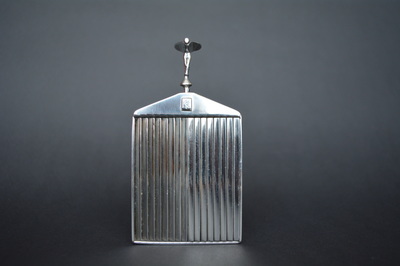 I think it is about time to replicate the 3D model onto canvas with some added ideas of my own. 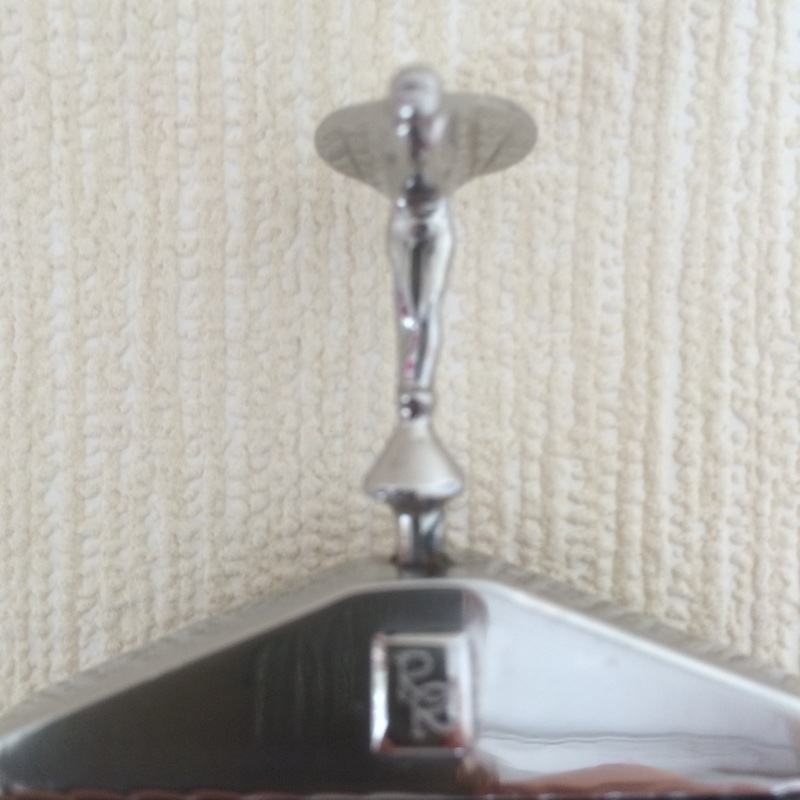 This is the start of another project for 2016.